Black Balloon Publishing, 9781936787654, 160pp. Daphne is willing to risk everything to get her son back. Surreal, funny and deeply affecting, I, Parrot is the tale of mother, a son, forty-two endangered parrots, and a fierce search for redemption and a "freer world." When Daphne loses custody of her son, she is willing to do whatever it takes to get him back--even if it means enlisting the help of the wayward love of her life, a trio of housepainters, a flock of passenger pigeons, a landlady from hell, a super-sized bag of mite-killing powder, and more parrots than she knows what to do with. 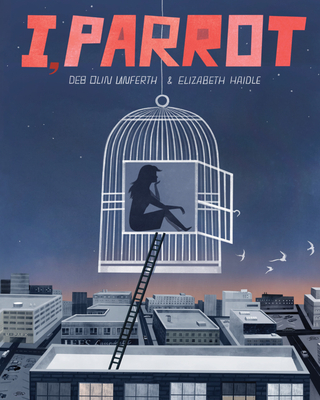 I, Parrot, by acclaimed author Deb Olin Unferth with stunning illustrations by artist Elizabeth Haidle, dips into the surreal with poignancy and humor. In this riveting, funny, and tragic graphic novel, Daphne must risk everything. Her quest is ultimately a tale about civilization's decline, the heartbreak of extinction, and the redemption found in individual revolution. Deb Olin Unferth is the author of four books, including Wait Till You See Me Dance and Revolution, a finalist for the National Book Critics Circle Award. Her fiction has appeared in Harper's Magazine, The Paris Review, Granta, and Tin House. She lives in Austin, Texas. Elizabeth Haidle is a freelance artist based in Portland, Oregon. She is the creative director and regular contributor at Illustoria magazine, while writing and illustrating a nonfiction graphic novel series and raising her teenage son.